Amazon is trying to poach shippers from FedEx and United Parcel Service by targeting fuel surcharges and extra fees that drive up the cost of home deliveries. The residential surcharge at FedEx is $3.80 per parcel and $3.95 at UPS. That can equal 40% of the average ground-delivery charge. The two carriers also impose fuel surcharges which, for a domestic ground delivery is 6.75% at FedEx and 7% at UPS. Extra fees can amount to 30% of the shipping cost. Amazon’s shipping rates (are) 10% lower than UPS and FedEx. Amazon which is rolling out its own delivery network, is trying to poach shippers from FedEx Corp. and United Parcel Service Inc. UPS 1.13% by targeting a common complaint: fuel surcharges and extra fees that drive up the cost of home deliveries. Amazon recently expanded its nascent home-delivery service, called Amazon Shipping, beyond test markets in London and Los Angeles. The online retailer is offering to pick up shipments from merchants’ warehouses and deliver them directly to shoppers. The end-to-end service is part of Amazon’s quest to handle more of the millions of items sold through its site. To woo shippers, the retailer is promising to forgo many fees that the traditional carriers use to pad their revenue, such as extra charges to deliver packages to homes, during the peak holiday season or on weekends, according to an email sent last week to shippers in the New York area and reviewed by The Wall Street Journal. “If it’s a guaranteed service with none of those surcharges, they’re going to undercut the residential delivery market,” said John Haber, chief executive of the supply-chain consultancy Spend Management Experts.An Amazon representative said the company is “always working to develop new, innovative ways to support the small and medium businesses who sell on Amazon, including testing shipping programs that help these businesses get packages to their customers quickly and reliably.” Such fees can add up. The residential surcharge at FedEx is $3.80 per parcel and $3.95 at UPS. That alone can equal more than 40% of the average ground-delivery charge, which was $8.81 at FedEx and $8.71 at UPS, according to the most recent public data. The two carriers also impose fuel surcharges, which fluctuate with market prices. The current weekly surcharge for a domestic ground delivery is 6.75% at FedEx and 7% at UPS. UPS also imposed surcharges on deliveries during the holiday shopping season each of the past two years. Mr. Haber said the extra fees can amount to more than 30% of the shipping cost in many cases. One merchant who reviewed Amazon’s shipping rates said they were about 10% lower than UPS and FedEx on average. Large carriers use the fees to help meet the cost of adding capacity to handle the surge in e-commerce packages. Residential delivery, for instance, can have higher costs than delivering to businesses, where multiple items can be dropped off. Fuel surcharges also provide transparency into a fluctuating cost of deliveries. 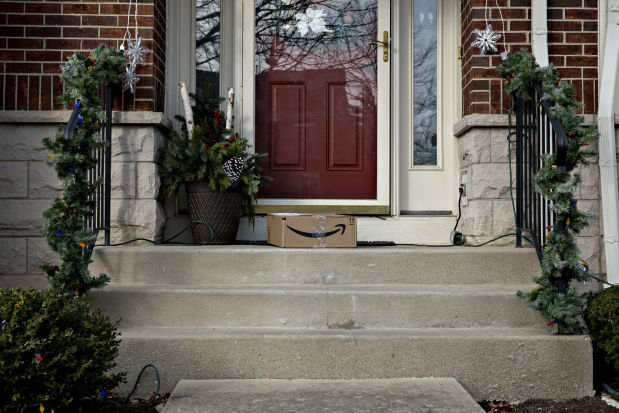 Since Amazon’s service is designed to deliver packages to homes, not businesses, the costs of residential delivery are factored in from the beginning, eliminating the need for a surcharge. The company wants to handle more of its own deliveries to keep up with its growth and loosen its reliance on the U.S. Postal Service and other carriers, whose rates continue to rise. FedEx and UPS typically raise rates an average of about 5% annually. Amazon’s shipping pact with the Postal Service, which delivers most of the retailer’s packages to homes, also has come under attack from President Trump for straining the agency’s operations and not generating enough profit. In addition to leasing airplanes and trucks, Amazon is recruiting small businesses to handle the last leg of a package’s journey to the consumer’s door. It has a program that lets entrepreneurs lease about 20 to 40 Amazon Prime-branded vans. FedEx and UPS have in the past played down the ambitions of Amazon, which is a significant customer for both, in the delivery field. They note that it would take billions of dollars and years of expertise to create a competitor with the breadth of coverage that either carrier offers globally. A FedEx spokeswoman also declined to comment on Amazon’s strategy. “We are confident in our position as a global transportation trailblazer, and optimistic about the future,” the spokeswoman said. Amazon is promising other features to position it as more user-friendly than traditional carriers. According to its marketing pitch to shippers, Amazon will offer rates that are easier to understand than the pricing systems that UPS and FedEx use. Also, it will ensure that if Amazon makes a delivery mistake, it won’t impact the merchant’s seller rating on its site.